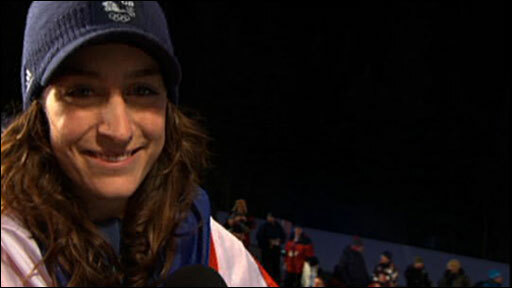 Amy Williams won Britain's first solo Winter Olympics gold medal for 30 years with victory in the women's skeleton. The Bath slider, 27, broke her own track record on the way to Team GB's first medal of the Vancouver Games in a time of three minutes 35.64 seconds. German Kerstin Szymkowiak was 0.56 seconds behind in silver with her team-mate Anja Huber taking bronze, while GB's Shelley Rudman finished sixth. A Canadian complaint about the helmet worn by Williams was rejected. It was the second complaint against the aerodynamics of her helmet after the United States issued a similar protest following the opening two runs on Thursday. But Williams shrugged off the fuss surrounding the design of her headgear as she capitalised on a 0.30-second overnight lead. She eclipsed the track record of 53.83 seconds, set in the first of her two runs on Thursday, by 0.15 seconds to open up a 0.52-second advantage over Canada's pre-race favourite Mellisa Hollingsworth. The pressure told on Hollingsworth, who faltered on her final slide and fell away to fifth, while Huber produced the second quickest time on the final run to move up from fifth to third. Rudman, who was seventh overnight, recorded her two quickest slides, including the overall fastest of 53.82 seconds on the final run, but could only reach sixth. Williams was last to slide and a solid run of 54.0 seconds was enough to hold off the German challenge and take the title. 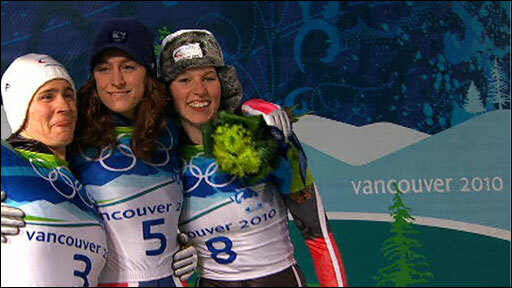 She is Britain's first individual champion since figure skater Robin Cousins won gold in Lake Placid in 1980. Golden girl Amy Williams completed her coronation as Olympic skeleton queen in much the same way she raced here in Whistler. Smoothly, cheerfully, coolly. 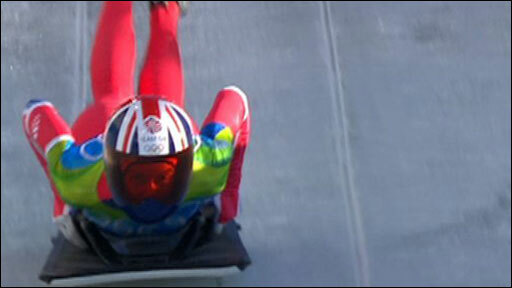 "It's crazy," Williams, the first British woman to win individual gold at a Winter Games since 1952, told BBC Sport. "I didn't think I'd be standing here, it's all such a blur, I can't remember most of the last run. "I came out at the bottom and saw our performance director Andi Schmid smiling, so I thought it must be good. "Before the race I was OK, it was a bit weird as I was on my own in the changing room and didn't know when to go out. "I was a bit nervous before it but I thought I've got nothing to lose so I thought I'd just go out and enjoy it and it was great." Her achievement is all the more remarkable as Britain does not have a full skeleton track to train on, apart from a dry starting section near Bath. Williams was a reserve in Turin four years ago when Rudman won silver and was used as a commentator on the event by BBC Radio 5 live. She is set to receive her gold medal in a ceremony due to take place at about 0300 GMT on Sunday. "Never in a million years did I think I'd come here and win gold," she added. "I don't think it will sink in for weeks and weeks. "It's amazing to do this for my country. I had nothing to lose here and I just went for it. I enjoyed every minute. "I've done everything I possibly could in the last four years to get here and to put in my best performance." The United States lodged a complaint, supported by five other nations, against Williams' helmet after Thursday's two runs but it was dismissed by skeleton's international governing body. 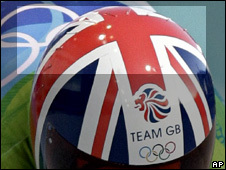 The US had claimed ridges on Williams' helmet gave her an illegal aerodynamic advantage. International Bobsleigh and Tobogganing Federation (FIBT) jury president Wolfgang Strauss said the helmet's manufacturer confirmed the ridges, or spoilers, "are an integral part of the helmet". Canada then lodged a second complaint after Williams' winning run on Friday but that too was thrown out. Williams' gold is Britain's first at a Winter Olympics since Scot Rhona Martin led the curling team to victory in 2002, and the nation's ninth gold in total. Sir Steve Redgrave, who won five Olympic gold medals at the Summer Games, said the victory would prove inspirational for Team GB, which has waited until day seven of the Games for its first 2010 medal. "It's a huge boost," he said. "All the British athletes in the village were buzzing that we were going to get a medal here and for that medal to be a gold one is very, very impressive. "They're going to be thrilled but they're also going to be thinking, 'Well, why can't I do that?' We've got a couple more chances but it was much needed for morale." The gold continues a fine run of British skeleton sliding since the sport was reintroduced to the Winter Olympics at the 2002 Salt Lake City Games. Alex Coomber won bronze eight years ago, and Rudman secured silver in Turin in 2006.